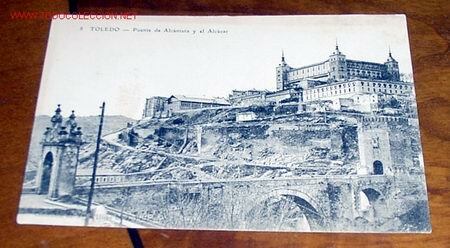 8 TOLEDO PUENTE DE ALCÁNTARA Y EL ALCAZAR TARJETA POSTAL COLOR,SIN CIRCULAR.HIJOS DE J.PELAEZ. 7 TOLEDO PUENTE DE ALCÁNTARA TARJETA POSTAL COLOR,SIN CIRCULAR.HIJOS DE J.PELAEZ. TOLEDO. COLECCION VIUDA E HIJOS DE J. PELAEZ. 38 PUERTA DE ALCÁNTARA. Hora oficial TC: 04:26:59 TR: 107 ms.